Tanno started gaga’s makeup look with golden skin using marc jacobs beauty re(marc)able full cover foundation concentrate in beige golden 36, followed by marc jacobs beauty re(marc)able full cover concealer in 1 awake under her eyes. next, she applied marc jacobs beauty o!mega bronzer perfect tan in tantric 102 to sculpt her cheekbones and added a soft pink to her cheeks draping marc jacobs beauty air blush soft glow duo in 500 lush & libido, a petal pink/orchid pink duo. Tanno then traced gaga’s eyes with marc jacobs beauty highliner matte gel eye crayon eyeliner in (fine)wine 47, a suede red shade, and brought the liner out past her eyes in a round shape and blended out. She added marc jacobs beauty twinkle pop stick eyeshadow in leila 416, a rose copper shade, in the center of the eyes to add sheen, and then applied marc jacobs beauty highliner matte gel eye crayon eyeliner in pink of me 59, a powder pink shade, along the waterline to open the eyes and make the whites of the eyes appear even brighter. Tanno put a touch of marc jacobs beauty highliner gel eye crayon eyeliner in peridot 90, a sage green shimmer shade, on the inside of gaga’s eyes. to add definition to the lashline, she then blended marc jacobs beauty highliner gel eye crayon eyeliner in blacquer 42, a black shade, and blended the liner into the (fine)wine 47 red shade. Tanno finished the eyes with marc jacobs beauty velvet noir major volume mascara to the top and bottom lashes. 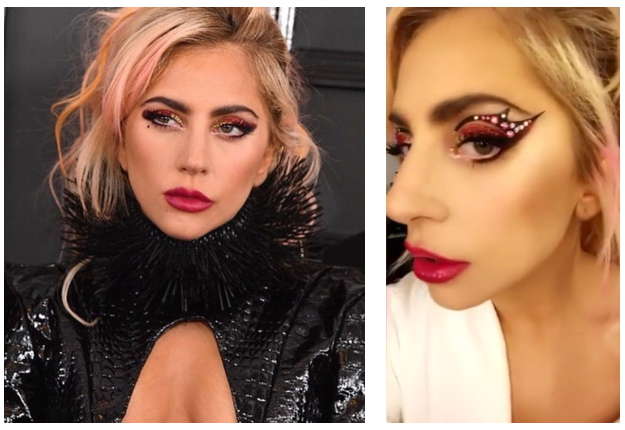 for the final step, Tanno paired gaga’s red eyes with a bright fuchsia lipstick for a “so wrong, it makes it right” makeup look. For gaga’s performance, Tanno created a wicked black liner in the shape of flames and finished by adding crystals.